One of the central challenges to contemporary political philosophy is the apparent impossibility of arriving at any commonly agreed upon "truths." As Nietzsche observed in his Will to Power, the currents of relativism that have come to characterize modern thought can be said to have been born with ancient sophistry. If we seek to understand the strengths and weaknesses of contemporary radical relativism, we must therefore look first to the sophists of antiquity--the most famous and challenging of whom is Protagoras. With Sophistry and Political Philosophy, Robert C. Bartlett provides the first close reading of Plato's two-part presentation of Protagoras. In the "Protagoras," Plato sets out the sophist's moral and political teachings, while the "Theaetetus," offers a distillation of his theoretical and epistemological arguments. Taken together, the two dialogues demonstrate that Protagoras is attracted to one aspect of conventional morality--the nobility of courage, which in turn is connected to piety. This insight leads Bartlett to a consideration of the similarities and differences in the relationship of political philosophy and sophistry to pious faith. 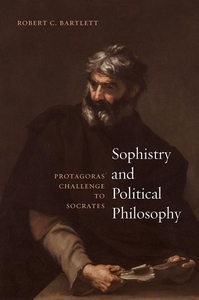 Bartlett's superb exegesis offers a significant tool for understanding the history of philosophy, but, in tracing Socrates's response to Protagoras' teachings, Bartlett also builds toward a richer understanding of both ancient sophistry and what Socrates meant by "political philosophy."